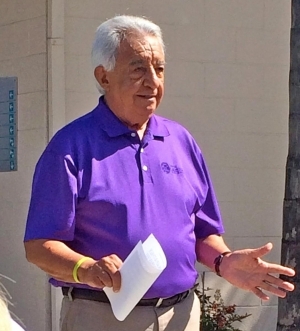 April 22, 2014 (La Mesa) – La Mesa Mayor Art Madrid held a press conference yesterday, flanked by his supporters, to formally launch his reelection campaign. “I pledge that the city will continue to be properly managed and that I will vigorously protect its character and heritage,” said Mayor Madrid. He cited successes under his leadership during his 24-year tenure as Mayor and his 10 years previously on the City Council, as well as a decade serving on civic boards and commissions. The Mayor said that public safety remains his top priority, including police and fire, as well as core services protecting health, safety and welfare of residents. He then touted accomplishments on his watch. “Just look around this city,” he said, citing new state-of-the-art public buildings, new infrastructure including the $2 million renovation of Allison and smart growth development around transit corridors. “That’s just the beginning,” he added, noting that soon La Mesa will embark on “another grand project that I initiated…the $5 million Downtown Village Streetscape Revitalizing project. After its completion, it will become the destination point for residents and visiors, generating new businesses and commerce for our downtown merchants. Madrid said he also championed redevelopment of Fletcher Parkway, purchase of surplus Caltrans property to build affordable housing units, and a Cox Cable grant to upgrade Council Chambers enabling council meetings to be live telecasted. “I also launched La Mesa’s Retired Senior Volunteer Patrol, started the city’s successful farmers’ market and initiative and assisted in directing the City’s highly successful year-long Centennial celebration,” the Mayor said. Recently Council members voted to curtail the Mayor’s travel allowance to attend events such as a national mayors’ conference. Madrid fired back that those trips led to successful grants of more than $12 million. “These grants have helped make La Mesa a safer, more walkable community for school-aged children, residents and guests,” he said. Increased tension between the Mayor and the Council in recent weeks culminated in members endorsing Arapostathis for the mayoral run. Critics have questioned what Arapostathis stands for. The Mayor made clear that the public knows where he stands, based on his long list of accomplishments. He also touted his creation of six new city boards and commissions to provide a “voice to the voiceless” on key issues for residents who had previously been ignored or rejected. Key issues facing La Mesa include whether a proposed high-rise building will be approved and the future of the former police station site in the civic center plaza. While some have called for sale of the latter, Madrid pledges to protect the community’s character, adding, that he aims to assure that the Civic Center campus and other valuable city-owned assets will be developed appropriately through public-private partnerships. 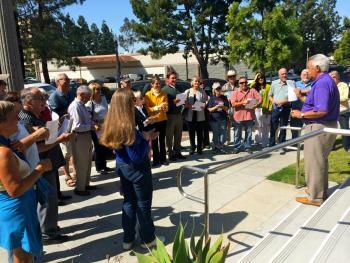 Supporters at the rally included physicians from Grossmont Hospital, Fair Trade La Mesa representatives and a variety of groups with which the Mayor has worked to benefit the city. Resident Don Wood proudly stated that he has put up his “Reelect Mayor Art Madrid” lawn sign saved from the last campaign. This will, however, be his last campaign, the long-serving Mayor said in response to a media question. Nothing like running a clean political campaign. Last night at a local eatery, Art told a small group of La Mesans that challenger Mark Arapostathis suffers from psychiatric problems. Nice, eh? Not that this is anything new, of course, it's merely Art's way of dealing with ANYONE who crosses him. Too bad more folks aren't aware of the crass incivility and corruption of the real Art Madrid. Thanks for giving credit where it's due, skidwell and gattobello. Without such corrections, one might mistakenly conclude (on the basis of this article) that Art's an honest, hardworking guy. covered straight up based on the candidate's statements, just as we did for Councilman Aarapostathis when he made his announcement to run against the Mayor: http://www.eastcountymagazine.org/la-mesa-races-heat-arapostathis-challenge-madrid-mayor Neither story analyzed either candidate's voting record or other actions and it would not be fair to do so in one candidate's story and not the other, since both are currently elected officials. There will be time for a more in-depth coverage in future stories on this race, including coverage of the series of debates that are anticipated to occur. With all due respect, Miriam, Madrid's article is roughly twice as long, contains a good deal of flattering editorial content and takes a shot or two at Arapostathis. Is that comparable treatment? and contained a lot more meat. We posted the ENTIRE video of Mark's speech; we didn't leave anything out. Art has of course had a much longer career in office, so would have more experience to discuss. But I was frankly surprised that Mark's speech did not touch on any issues, merely stated he wants to run to continue his record of public service. Art by contrast discussed a number of issues and made clear his positions on them, which Mark did not do. It would not be fair to short-change a candidate who prepares a long and detailed discussion of issues and accomplishments just because his opponent did not do so. Of course as Mark develops his campaign platform, if he delves into specifics on issues and positions, we will be happy to report those too. Mark's announcement was short. But if Art been telling the truth--talking about real accomplishments--his would've been even shorter. I wouldn't expect analysis at this stage of the game, but to allow bald-faced lies to stand without so-much as raising a journalistic eyebrow? That surprised me a little. Look forward to a fuller treatment of the race. Glad you're keeping vigil. if there were any untruths in the speech, Craig. I know you've questioned the grants, and I just haven't had time to verify that yet with city staff due to other breaking news that was pressing. I know that ECM's on top of things, Miriam. Thanks for the good work. The City staff are the ones who do the leg work for the grants and funding. My thanks are to them for first, doing their jobs so well to get these grants, and second, for their professionalism in dealing with a Mayor who takes credit for their efforts. You mean the grant money raised by staff (that Art claimed responsibility for)? Exactly right, Scott. But maybe that's an example of Art's "integrity and values"? By the way, great photo above. Not one recognizable face save mayoral sycophant Dexter Levy. Where are Art's fellow councilmen? Oh ya, they're supporting Mark Arapostahis. ALL of them. Art says a lot of things. Most of it, especially during election season, patently false. How 'bout the credit he takes for the "councils and commissions"? You know, the ones he packs with his own hand-selected, city ciphers? Impressive. Somehow the article fails to mention the sixty-plus million dollar unfunded pension liability that's accrued under Art's "leadership." Also missing is any mention of the increased crime, high sales tax, oppressive business regulation, unprecedentedly divided council, and, of course, the never-ending use of threats and intimidation he uses against both citizens and staff to get his way. Art says he's looking forward to a series of debates with challenger, Arapostathis. I wouldn't if I were him. I debated Art in 2006. He's a paper tiger. Go for it, Mark! Art's a bully, nothing more. Still taking credit for work by city staff!